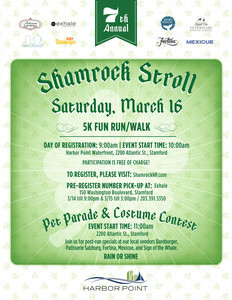 Don your green and participate in the Harbor Point Shamrock Stroll 5K on Saturday, March 16 beginning at 10:00 AM at The Point Cafe (next to Bareburger), 2200 Atlantic Street in Stamford. After your run, stick around for the Pet Parade and Costume Contest beginning at 11:00 am. Learn more and register for these two events here.